The Official Play Magnus Chess Set! The official Play Magnus Educational Chess Set is a collborative effort between World Champion Magnus Carlsen and the British firm SAC Chess Distribution Ltd. This is an educational chess set suitable for children of the ages of 5+. The sleekmodern design complements the very popular ‘Play Magnus’ App which has been downloaded in more than 200 countries. The height and base of the pieces are a modern interpretation of the classic Staunton set. The solid robust weighted plastic pieces are designed to be very comfortable to hold. 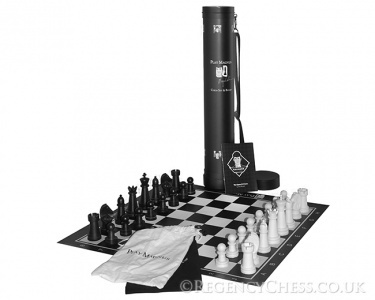 The sharp black storage tube, with ‘Play Magnus’ App images, has an adjustable and detachable carrying strap. This set is a great gift for the kids!